Fact Check: Did Republicans ‘Essentially’ Repeal Obamacare? President Donald Trump claimed the GOP tax bill that Congress passed Wednesday “essentially” repeals Obamacare. 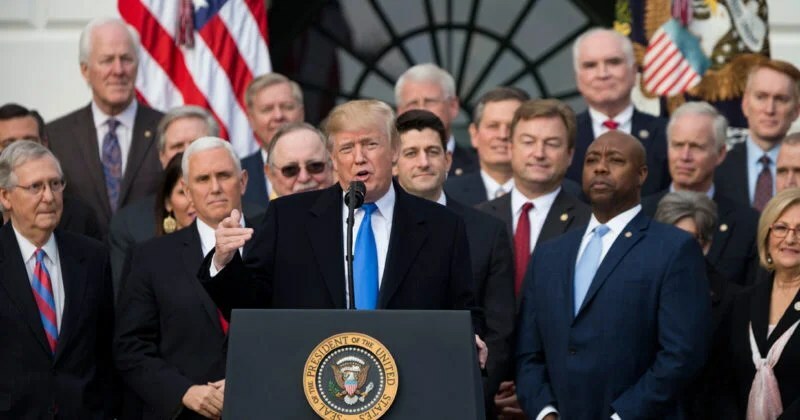 “We—I hate to say this—but we essentially repealed Obamacare because we got rid of the individual mandate, which was terrible,” said Trump during remarks after passage of the bill. Republicans voted to repeal the individual mandate—the requirement that Americans buy health insurance or face a penalty—but left all other provisions of Obamacare in place. Republicans have long vowed to repeal the Affordable Care Act—the 2010 law that significantly expanded the rolls of Medicaid, created an insurance exchange with subsidies for low- and moderate-income people, and imposed new requirements on insurers and employers. Congress successfully passed a repeal bill in 2015 only for it to be vetoed by then-President Barack Obama. The legislation would have undone the Medicaid expansion—a provision that extended insurance to an additional 12 million people—and subsidies for the health insurance exchanges. It also would have repealed the individual mandate, employer mandate, and many of the taxes imposed on businesses. Once Trump assumed office, repeated attempts were made to undo the law. A bill passed in the House would have rolled back Medicaid, removed the individual mandate, repealed key tax provisions, and offered tax credits instead of subsidized health plans on the exchanges. Several iterations were called repeal even though they left large aspects of Obamacare intact. Congress ultimately failed to pass even a “skinny repeal,” which would have simply undone the individual and employer mandates. Republicans in Congress were able to successfully undo that mandate Wednesday, but it was the only Obamacare provision touched by the tax bill. Repeal of the individual mandate is certainly a significant victory for congressional Republicans; it’s one of the most controversial provisions of Obamacare. Yet the change is modest compared to prior Republican attempts at repeal. Trump claimed that Republicans repealed Obamacare because the mandate was a “primary source of funding.” But the Congressional Budget Office estimated that only $35 billion in revenues would be lost over 10 years without the individual mandate. Repeal of the 3.8 percent surcharge on capital gains and the 0.9 percent Medicare payroll tax, by comparison, could result in revenue losses over 10 years of $250 billion and $150 billion, respectively. These sorts of revenue offsets will remain intact, however, and Congress will continue to subsidize the Obamacare exchanges and Medicaid expansion. Some predict that repeal of the individual mandate may actually lead Republicans to shore up the Obamacare exchanges. Despite a doubling of premiums in the private insurance market since 2013, the mandate did help reduce premiums by forcing younger, healthy Americans to enroll. Without it, the CBO predicts even higher premiums in the marketplace. Republicans may introduce a legislative fix like the Alexander-Murray bill proposed earlier this year in an attempt to stabilize the exchanges. The fate of Obamacare, however, is far from certain. The Trump administration has taken steps that undermine the health care law in recent months. It discontinued making subsidy payments to health insurers and slashed the budget for Obamacare enrollment efforts, among other changes. The White House did not respond to a request for comment in time for publication.